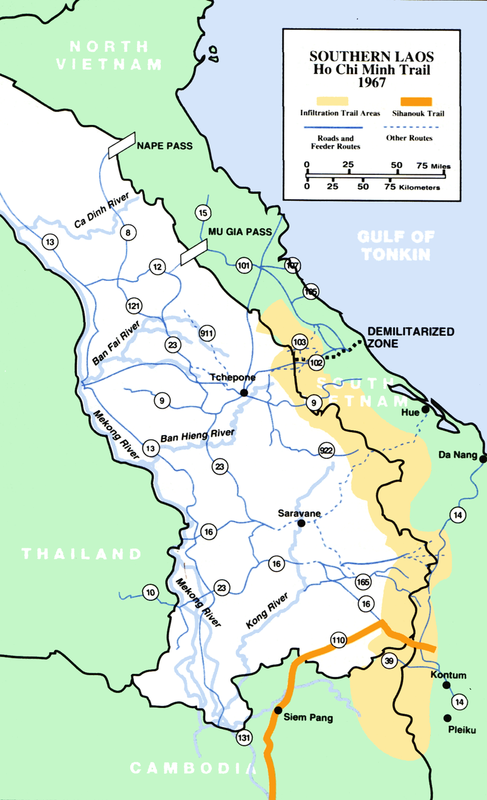 The Ho Chi Minh trail, known within Vietnam as the “Truong Son Strategic Supply Route,” was an elaborate system of mountain and jungle trails linking North Vietnam to its allies in the South Vietnam, Cambodia, and Laos. During the Vietnam War, it served as the primary artery for moving troops, vehicles, and supplies. Comprising more than twelve thousand miles of roads and paths through some of the world’s harshest geography, it was a vital gateway linking a divided nation. The road network extended from Mu Gia Pass in the north, southward along the heavily forested western slopes of Laos, before entering South Vietnam at the northwestern end of the Plei Trap Valley — the “Valley of Tears” — and points south. It was kept in good condition by 300,000 full-time workers and almost as many part-time farmers, many of whose bodies fill the 72 Vietnamese military cemeteries that testify to the trail’s devastating human toll. Despite Hanoi’s attempts to keep the details of its overland infiltration network a secret, by 1960, US knowledge of the route was widespread enough that it became a subject of intelligence predictions. An August 23, 1960 CIA report noted increases in support from the North of the Southern insurgency, citing heightened movement of senior cadres and military supplies such as communications equipment heading south through Laos and Cambodia. Before the year’s end, American military planners were advising the Diem government that it had to gain “firmer control of its frontiers,” to prevent further infiltration by the Viet Cong into South Vietnam. A September 1966 intelligence study estimated that during the October-November 1965 period, the Ho Chi Minh trail had been disgorging 4500 enemy troops per month and 300 tons of supplies per day. Roadwatch reports and photo reconnaissance verified increased North Vietnamese buildup along the lines of communication from the North into Laos and South Vietnam, revealing new unnumbered roads under construction in the Laotian Panhandle, heading southward.